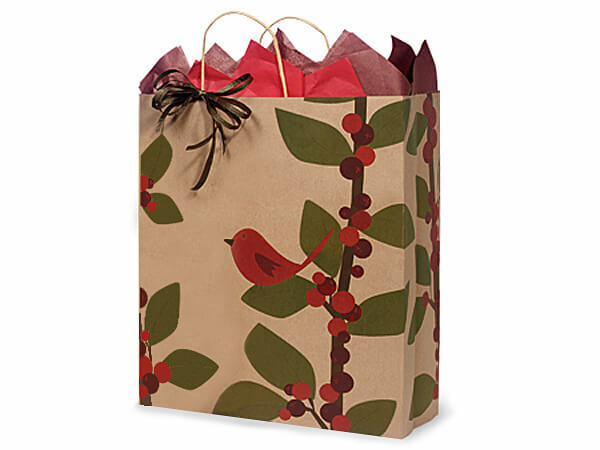 Queen Red Bird Berries 100% Recycle Paper Bags 25 16x6x19"
Queen size Red Bird Berries Shopping Bags by the 25-Pack are made from 100% recycled kraft paper. Green Way® Eco-Friendly Packaging. Bags are 100% recyclable and contain minimum 40% post consumer recycled content. This is a Nashville Wraps exclusive design! Made in the USA. Our Red Bird Berries Shopping Bags are made from 100% recycled kraft paper and carries the Green Way ® logo. Bags are 100% recyclable and are made with 95% post-consumer recycled content. Design features a beautiful red cardinal resting on a branch covered in red berries. Bags have kraft paper twist handles. These shopping bags are available in cartons, mini-packs and an assortment. Individually UPC coded so great for resale. Made in the USA. Shop Nashville Wraps for exclusive Christmas Gift Bags for holiday gift wrapping!